The Reason for the Bill of Rights………..
During the period from the drafting and proposal of the federal Constitution in September, 1787, to its ratification in 1789 there was an intense debate on ratification. The principal arguments in favor of it were stated in the series written by Madison, Hamilton, and Jay called the Federalist Papers, although they were not as widely read as numerous independent local speeches and articles. 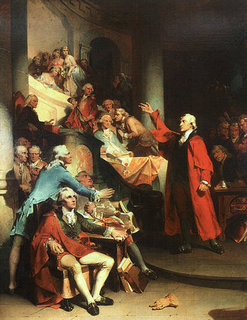 The arguments against ratification appeared in various forms, by various authors, most of whom used a pseudonym. Collectively, these writings have become known as the Anti-Federalist Papers. We here present some of the best and most widely read of these. They contain warnings of dangers from tyranny that weaknesses in the proposed Constitution did not adequately provide against, and while some of those weaknesses were corrected by adoption of the Bill of Rights, others remained, and some of these dangers are nowcoming to pass. #2: We Have Been Told of Phantoms. #4: Foreign Wars, Civil Wars, and Indian Wars — Three Bugbears. #5: Scotland and England — A Case in Point. #6: The Hobgoblins of Anarchy And Dissensions Among The States. #7: Adoption of The Constitution Will Lead to Civil War. #9: A Consolidated Government Is a Tyranny. #10: On The Preservation of Parties, Public Liberty Depends. #11: Unrestricted Power Over Commerce Should Not Be Given The National Government. #12: How Will The New Government Raise Money? #13: The Expense of The New Government. #15: Rhode Island Is Right! #16: Europeans Admire And Federalists Decry The Present System. #17: Federalist Power Will Ultimately Subvert State Authority. #21: Why The Articles Failed. #23: Certain Powers Necessary For The Common Defense, Can And Should Be Limited. #29: Objections to National Control of the Militia. #30-31: A Virginia on the Issue of Taxation. #34: The Problem of Concurrent Taxation. #35: Federal Taxing Power must Be Restrained. #36: Representation and Internal Taxation. #37: Factions and the Constitution. #38: Some Reactions to Federalist Arguments. #39: Appearance and Reality– the Form Is Federal; the Effect Is National. #40: On the Motivations and Authority of the Founding Fathers. #44: What Congress Can Do; What a State Can Not. #46: Where Then Is the Restraint? #47: “Balance” of Departments Not Achieved under New Constitution. #48: No Separation of Departments Results in No Responsibility. #51: Do Checks and Balances Really Secure the Rights of the People? #52: On the Guarantee of Congressional Biennial Elections. #53: A Plea for the Right of Recall. #54: Apportionment And Slavery: Northern And Southern Views. #59: The Danger of Congressional Control of Elections. #60: Will the Constitution Promote the Interests of Favorite Classes? #67: Various Fears Concerning the Executive Department. #68: On the Mode of Electing the President. #69: The Character of the Executive Office. #70: The Powers and Dangerous Potentials of His Elected Majesty. #71: The Presidential Term of Office. #72: On The Electoral College; on Re-eligibility of the President. #73: Does the Presidential Veto Power Infringe on the Separation of Departments? #74: The President as Military King. #75: A Note Protesting the Treaty-making Provisions of the Constitution. #76-77: An View of the Appointing Power under the Constitution. #83: The Federal Judiciary and the Issue of Trial by Jury. #84: On the Lack of a Bill of Rights. This entry was tagged government, politics. Bookmark the permalink.